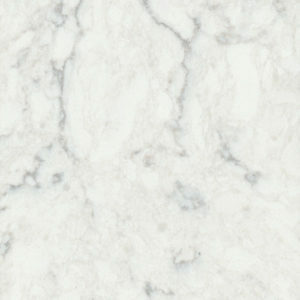 Silver Cloud (also known as Viscount White, or Viscon White) is a popular, white granite with silver movement. The stone here is used to add a modern tone to the perimeter of the kitchen as well as accent the white, wooden cabinets. Heat and Acid Resistant: Hot pots and pans can be placed on granite countertops at room temperature, and granite will resist most household acids. Simple Maintenance: Applying sealer two to three times a year will help prevent any future liquid spills from staining the stone and will also help make sure no bacteria is caught in the stone’s pores. 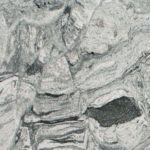 Unique: Granite is a natural stone, meaning no two slabs will ever be identical. The minerals within a granite slab will always be different, adding exclusive character to your kitchen. Value: A granite countertop will significantly boost a home’s resale value. The countertop is cut with a straight edge (also called pencil or eased), giving the kitchen a clean look that does not clash with the dramatic movement of the granite. Ready to start your remodel project? Contact us to get started or try out our kitchen visualizer to design your own kitchen!